Technology is an ever-changing field that benefits humanity in several ways. Some examples of its benefits include: helping people complete their tasks more rapidly, sustaining the lives of those in critical condition, advancing the means of communication to allow for easier contact among people around the world, creating more efficient means of transportation so people can get from point A to point B faster, and enhancing military capabilities to the point of being able to combat foreign and domestic threats more efficiently without the loss of even a single life. Technology will always constantly advance due to our nature as humans to create and or use tools that will assist us with the completion of our everyday tasks. This makes technology an excellent subject matter for any post and or website that aims to write about interesting and eye-catching topics. 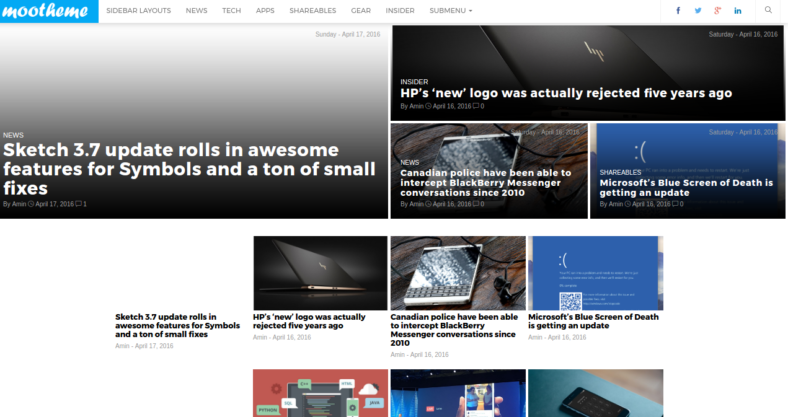 For those who are interested in creating such posts or websites, we will be showcasing 20 of the most well-designed technology news magazine themes available today. We will also be giving brief descriptions for each of these amazing themes, so read on. 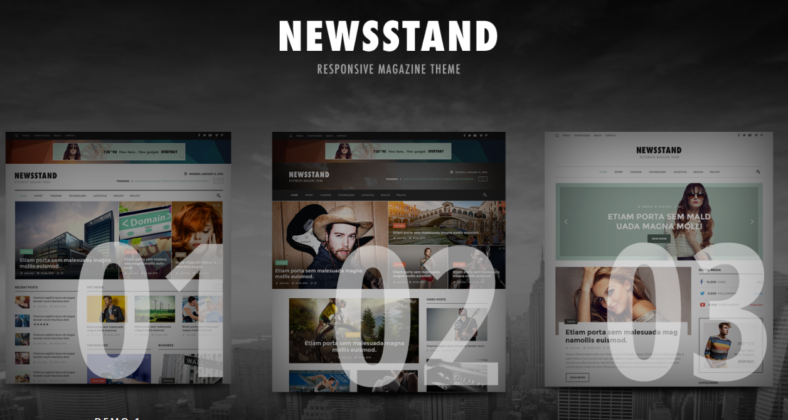 Newsstand is considered to be a completely responsive WordPress theme that can be viewed by any and all devices that are capable of accessing the web. This will often lead to a greater range of readers as well as a greater increase of web traffic to the site. 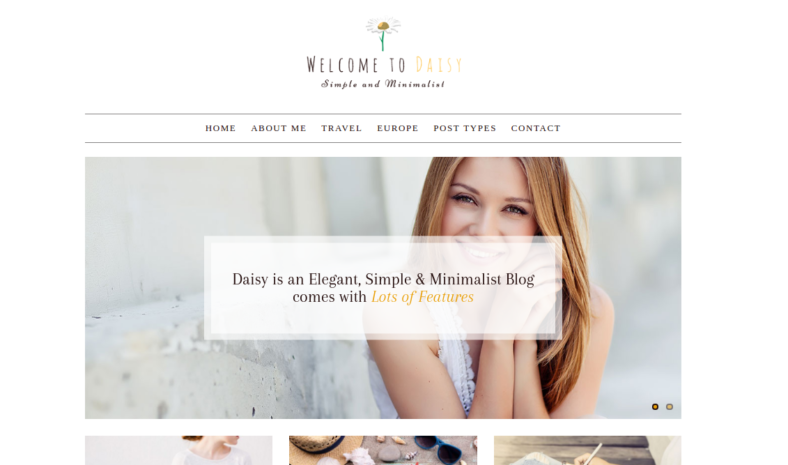 This WordPress theme and template is capable of being used for a variety of topics and posts that a person will wish to create, be it a fashion blog, a news magazine or even a technology review magazine. This is possible because of the professional-looking design and easy page-editing function, thanks to the powerful page builder feature included in this cool website theme. Aside from the powerful page builder feature, this magazine Vintage WordPress theme is also retina-ready, a term used to describe the site’s ability to automatically adjust its visuals to reduce the strain on a reader’s eyes after long periods of looking at a screen. As with most web page themes and templates available today, it also has a built-in feature that would allow for the easy addition of social media sharing options, making it more convenient to share and display the site content on leading social media sites worldwide. With Template Monster’s special drag and drop function, the creation of this best WordPress theme template can be both easy and enjoyable. The function allows for the easy management and adjustment of the design and look of the site. Aside from the amount of time you can save from using the drag and drop feature compared to more traditional means of uploading content, you are also able to access the live customizer feature that can give you total control over how you will interact with the design of your soon to be developed web site. Gamestick is a Wordpress news magazine that focuses on news and articles about gaming and gaming technology. As you can see on the home page for this website display, there is an image from a popular racing video game that typically requires certain specs for running the game on a device. With this in mind, one can easily write an article about the necessary gaming specs needed to run the video game as well as a review of the performance of the game. This review can touch on the graphics quality, the frames per second, the actual gameplay and other game features, making it an interesting technology news magazine WordPress topic. Aside from giving writers an easy and fun topic to discuss, this gaming website theme for WordPress also comes with a variety of features that would make the act of creating the website itself simple and quick. One good example of such a feature would be the ability to easily create and design your website with even little knowledge about coding and site creation, thanks to its easy-to-follow instructions regarding the creation of your own site. 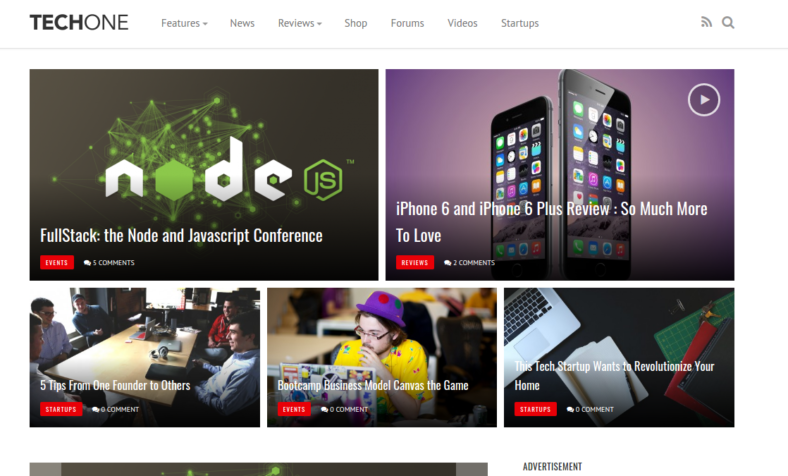 Techone is a basic yet elegantly themed blog that can be considered a clean and simple WordPress theme. It is rather efficient when it comes to displaying a lot of content without actually affecting the speed or performance of the website you are going to make from this free website theme. Its basic and simple coding allows it to be great practice for fresh or new site managers to gain some experience in actually creating and developing a website. This creative website theme is also made in a way to be fully responsive and capable of running on any platform or device, making it easily accessible to readers whether they’re using a desktop or a smartphone. It can also adjust the page size and resolution to make it compatible with the device being used to view the site. 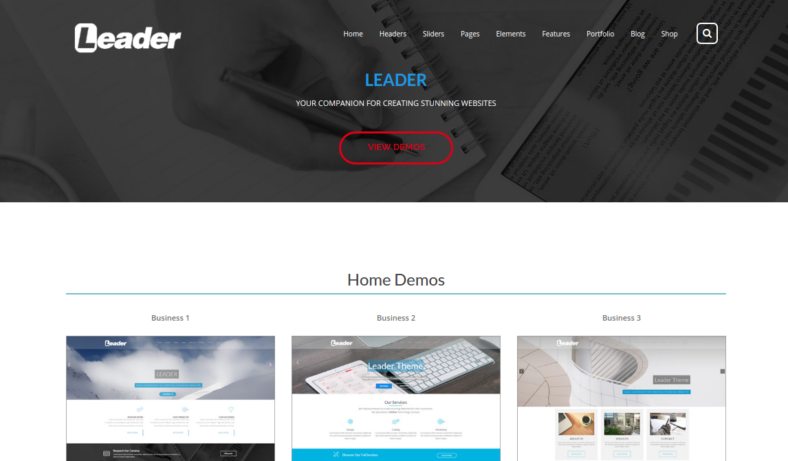 Leader is a stylish WordPress theme and template that can be used for several purposes since the theme template is very versatile due to its clean and extremely simple design. Aside from it being a simply designed WordPress theme, it also has several pre-made home pages that you could either select as a guide on how to complete your website theme or you could use one of the home page samples as your website’s theme or background. This theme template also comes with a child theme support wherein there will be a means of restricting children from viewing the entire site but the child will still be able to access the child-friendly posts on that site. This website template is also made to be SEO or search engine optimized, making it ideal for those who want to get their site on the top rating list in specified search engines. There are also a lot of available features for the construction and alteration of this theme template to fit your preferences, which make this truly one of the most powerful multi-purpose WordPress themes available online. 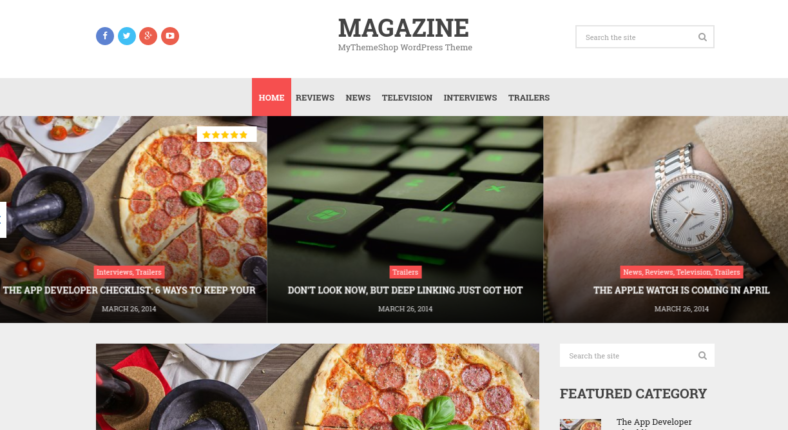 Magazine is a WordPress theme that is created for the purpose of generating sites that are capable of handling large amounts of content without actually crashing. This is mostly achieved through the ability to create multiple layouts and posts on a single page so as to reduce the needed time to actually search through the site. 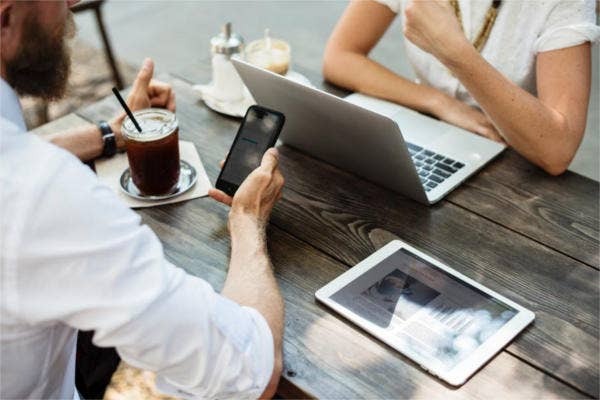 This site also features an integrated social sharing option that will allow the site manager to add links and widgets that can connect the site to that of the different social media websites. This new WordPress theme is capable of being used for a variety of topics and ideas mainly because of its flexibility. It is therefore ideal for those who intend to do a lot of technology-related posts or reviews since the interface allows site managers to feature eye-catching visuals. Mr.Gizmo is an attempt at a new means of creating the best WordPress theme and template that runs solely on the new and innovative version of CSS coding. Typically, a web site or web page is designed with the implementation of both HTML and CSS; thus, the other term of a website would be an HTML/CSS web layout. This is because CSS coding is basically an addition to the HTML file that allows adding extra features to the HTML file. However, this WordPress theme template is able to improve the efficiency of a site by implementing a grid-based CSS layout, which allows users greater control as to how the layout of the page should be designed. Since you can design the layout of the web page to look however you want, you can create a visually appealing home page that readers will enjoy visiting not only for the informative articles but also for its eye candy factor. Whenever we think about applications for our phones or devices, we would always think about how well the applications do their programmed functions. We may also end up researching on whether or not the application we are using is up to date and is supposed to be doing what it is doing, making the discussion about applications a great topic for when you are writing an article or a post related to technology or software. AppTheme is a responsive WordPress theme template that has been designed to help create a site that is dedicated to sharing information related to software updates and implementations. Apps and software are common topics wherever you visit online. This is mainly because of the fact that apps and software are constantly being used and updated on a daily basis so as to be able to reduce the stress or workload of everyday life. The main design for the home page of this minimal WordPress theme is a match made in heaven because the home page displays a specific pair of gadgets along with the option of downloading a certain app. This informs the website reader that the site they are currently visiting is one that’s dedicated to the discussion of applications or the download locations for certain applications. 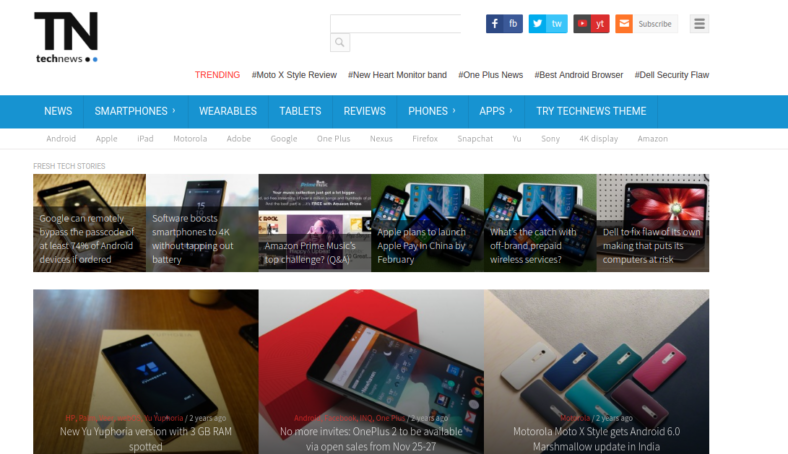 GadNews technology review WordPress theme is a beautifully designed web site theme that is designed in a way that would perfectly reflect the definition of its name, which is a site dedicated to the creation and distribution of information pertaining to gadgets or other similar technology. Thanks to its clean and beautiful design, there are almost infinite possible ways of designing the web page template to match the design you want the most, be it by using a preset design or by creating a completely custom-made design. The seemingly infinite choices of design is made possible by the WordPress live customizer feature that allows for the real-time editing and designing of the web page according to a site manager’s preferences. This is also made possible by the well-coded HTML and CSS components of the theme template, which is reviewed and simplified in a rather rapid process. Technology is a topic with a near infinite amount of topics to discuss, which makes it a great subject matter for when you are going to be writing a blog or a magazine article. But since most reading materials in this modern world are now digitized and are available to read on different forms of devices and gadgets, it only makes sense to post your writings online for everyone to see compared to the more traditional method of printing things out in physical copies. 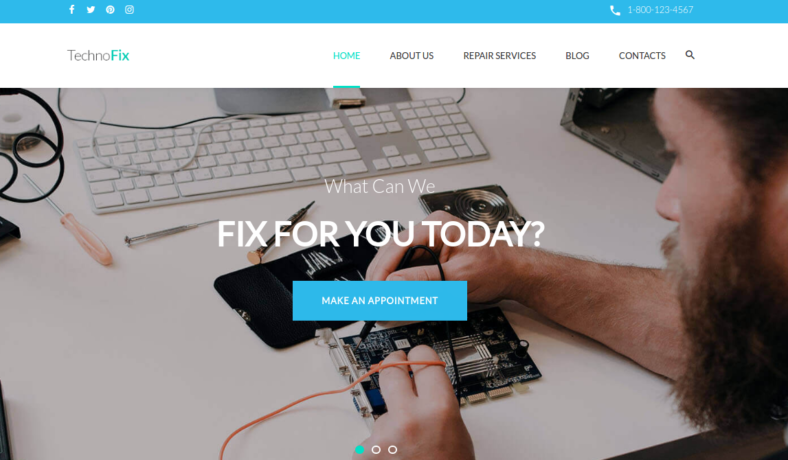 TechNews is a take on creating a modern technology WordPress theme that is capable of supporting even the most content-rich responsive website theme with little to no decrease in performance or speed whatsoever. This theme can also be considered as an AdSense optimized WordPress theme because of the way it was designed to generate some passive revenue for the site manager. The developers of this simple WordPress theme were inspired by the fact that around 30 to 50 percent of people who have access to the Internet tend to do their browsing by using their smartphones and or tablets rather than using their laptops. Knowing this, they designed the theme template to be capable of running on any device platform available so as to target a larger group of people who can access the Internet. The creation of an indispensable news & magazine WordPress theme was the main objective of the creators of the Next Mag template. This theme template features a variety of designs and layout options that will make a rookie create a seemingly professional-looking web site with fully functional settings, widgets, and features. This is done with the thought that since technology is supposed to be used as a means of simplifying the life of humans, they strove to create this simple yet elegant theme template. It is so easy to use that even a person with little to no prior knowledge of the means of creating a fully functional website can easily create a site that appears to be made by a professional. You are also given the option to either create your own theme and or design from scratch, or use the beautifully made demos available. The creation of a responsive multi-concept blog theme that is adaptable for news and magazine themes is a concept that the designers of Devation have taken in mind and, as you can see, they have in some degree achieved their goal. Devation is a WordPress theme for programmers that is aimed at being a lightweight and fluid theme template which can easily support the addition of several high-quality content as well as be able to support access from several different device platforms. This is done through the use of the built-in responsive feature, which helps balance the theme between web page design and web page functions. 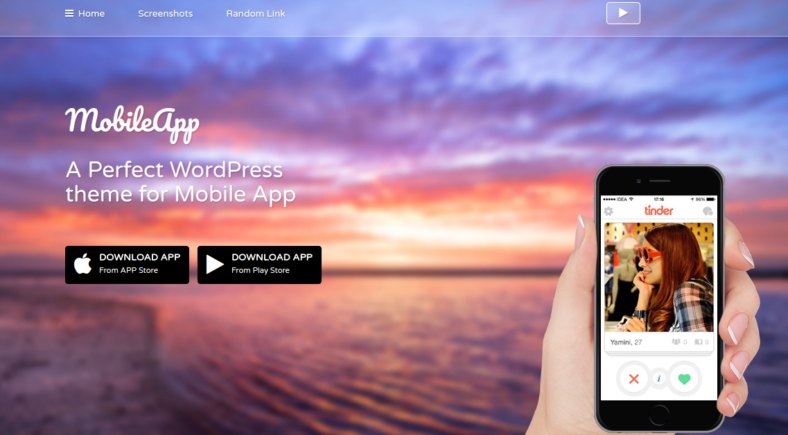 MobileApp is a top WordPress theme that is designed to be a website capable of supporting the addition of download links and functions, which can help viewers get redirected to the download page for the program or app they are searching for. MobileApp also appears to be easy on the eyes because of its great design as well as the retina-ready feature that is built into the actual design of this WordPress theme template. 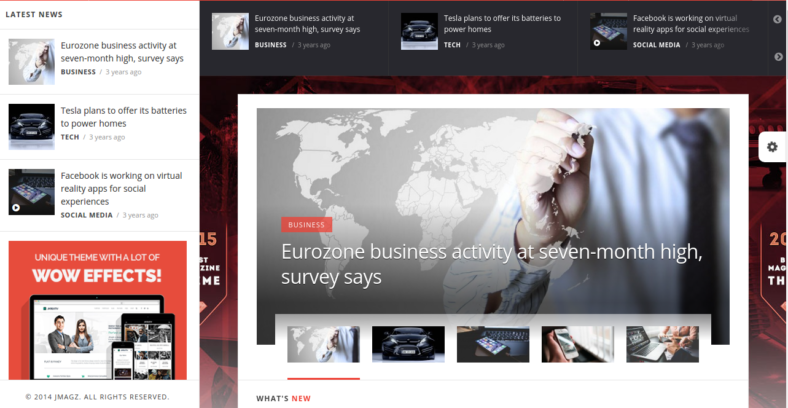 The INNOVATION multi-concept magazine and blog theme takes after the definition of its name. It is truly innovative when it comes to the number of different available layouts. Each person who has purchased this theme can gain access to hundreds of demo designs that they could implement directly into the personal design for their web page. This site is also made with the fully responsive feature, which allows it to be viewed or accessed from any device available with an internet access. Additionally, it is retina-ready, which means the site is made in a way that reduces the overall strain the light from the screen of your devices may impose on your eyes. Here is a good idea for a topic regarding technology: as new technology appears, there will always remain one major issue, and that would be the maintenance of the quality or state of our devices. Every time our gadgets act up, this leads us to research online for every possible means of fixing our beloved devices. 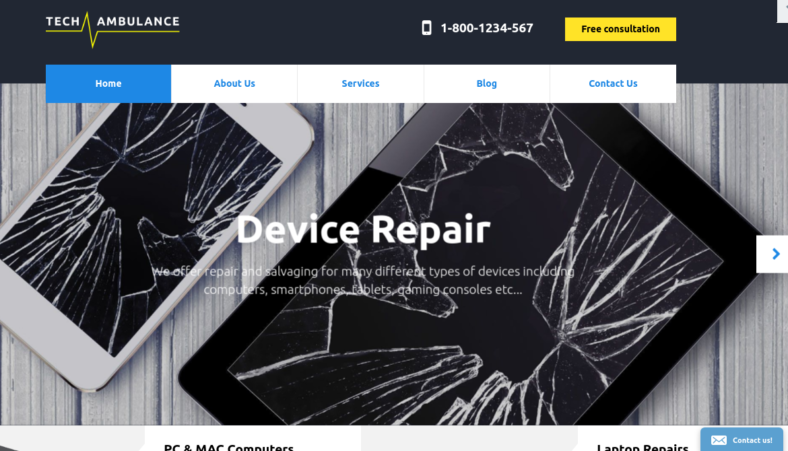 Tech Ambulance takes advantage of this concept by creating a fully responsive free WordPress theme that is capable of handling large amounts of content, which will either be paragraph after paragraph of instructions on how to fix a defective gadget. It is also ideal for content such as media files and downloadable PDF files. It even has access to a map feature that will help the site manager easily add maps and locations to shops that could possibly assist the reader in repairing or restoring their devices to health. This creative WordPress theme and template is designed in a way that would give users full control over how to interact with the theme, such as the color scheme, the background images, the actual layout of the web page, and even the addition of customizable widgets, It also features social media links for sharing content, which is always an effective means of gaining more web traffic to any site. This tech blog WordPress theme is indeed a must-have theme template for more experienced website makers. As an added bonus, the developers of this theme will even willingly assist you in the completion of creating the website for free. This multi-purpose magazine template is designed in such a way that it can be used for any other site such as fashion blogs, travel reviews, online stores, jewelry displays, and many more. 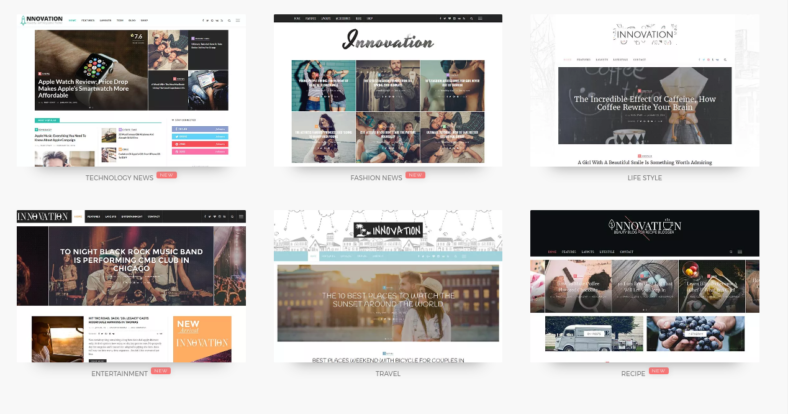 This flexibility allows users to easily create multiple sites from just the single template. 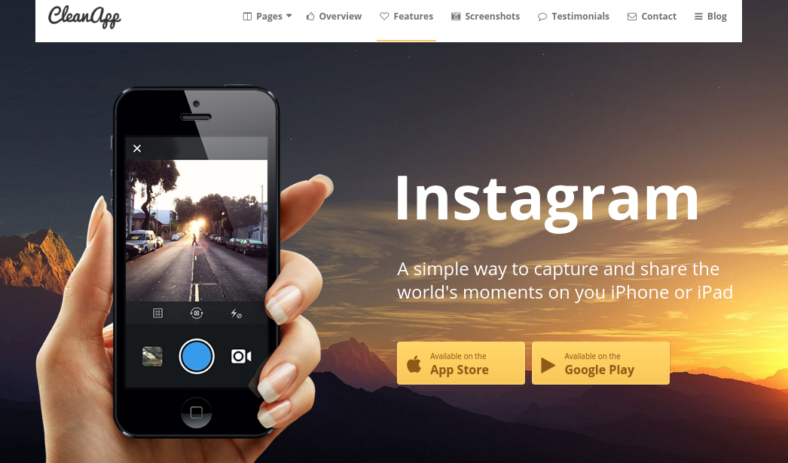 This theme template is even capable of displaying images and playing videos as needed by the site manager. You are even granted access to a dedicated tech support center that you can contact in the event that your site is encountering certain issues or requires an update. This theme template is supposedly made with the latest designs that follow the most current trends in order to create a beautiful and modern-looking web site. It even has a high standard review system that would allow the site manager to easily review the quality of the posts as well as the level of interest each site visitor has in the content of the site. CleanApp is a great WordPress theme that focuses on the idea of creating a web page that will allow the user to easily display applications and features, be it ones they made themselves or those made by other people. This theme template has been optimized in a variety of ways, the most notable of which would be the optimization of the download feature which allows for faster downloads of the applications being shown. 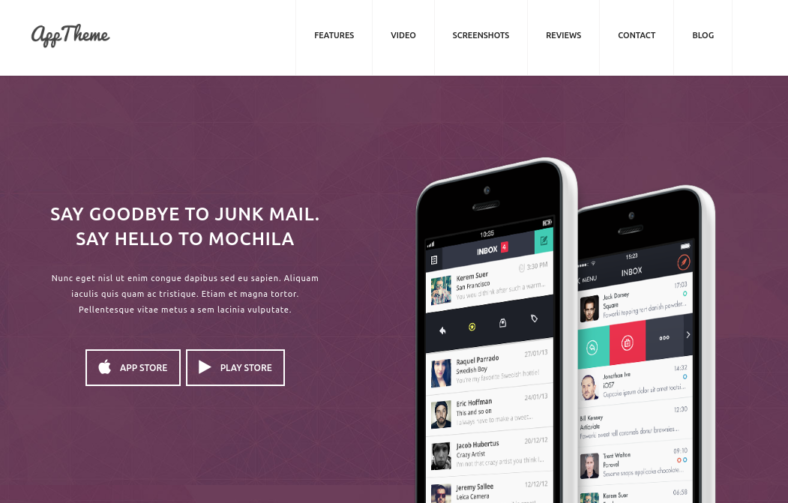 This is a rather clean and responsive WordPress theme. Compared to the other themes available, you may assume that this theme template is outdated. But the fact of the matter is that although this theme template is simple and basic, it actually contains tons of hidden features that would allow for the easy creation of several sites in a short amount of time. With all these great choices available, you can easily find the ideal theme that best suits your type of website. You can be sure that whatever your final selection may be, you are guaranteed to have a professional-looking and well-designed web page that is sure to attract readers and keep them coming back. So be sure to study each available theme carefully then make your choice smartly. You can then start creating your own website today.